“My name is Massimo,” says, Signore Carriero. ”I am an Italian living in UK. The shop is in Italy and is run by my friend Fabio. The project was made by the two of us and another colleague, Alessandro. I am an engineer and I designed and produced parts for the bike. Fabio is specialised in fabrications and welding and Alessandro is mechanic and a bike builder”. Massimo tells us that the bike was found in Ireland, of all places. “I have friends there, so they collected the bike for me and brought it back to England. I then arranged to send it to our shop in Italy”. That sounds like quite the voyage. 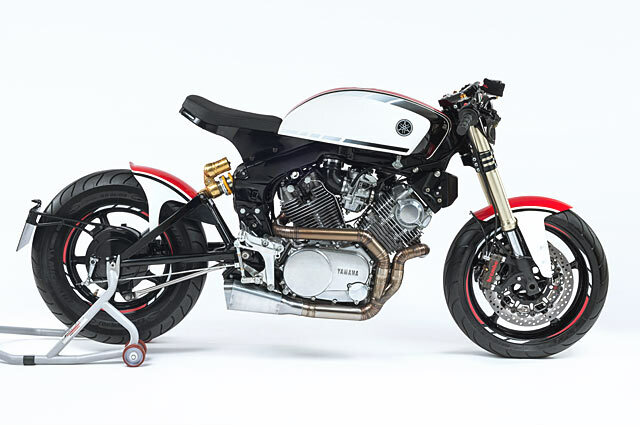 “A while ago we were preparing a Virago XV500 in our shop. The shock absorber embedded in the frame was beautiful to my eyes and I fell in love with the design. 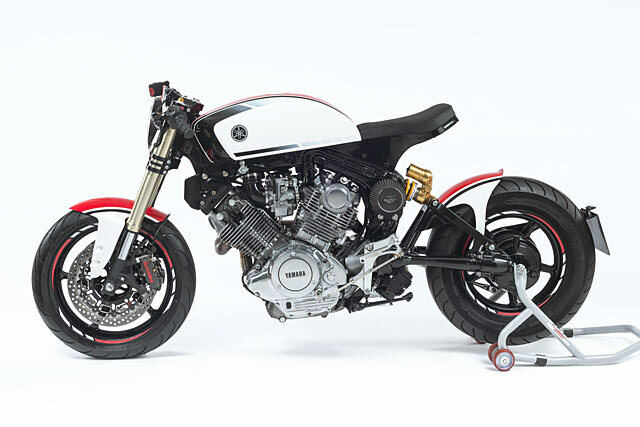 From there, we started to look into building an XV café racer but with a stronger engine and some racing DNA. We started to look at the 750, but that model was never sold in Italy so naturally we had to look elsewhere. That turned out to be Ireland”. The team’s first thoughts on the design were focused on a race-based look, a sporty riding position and decent handling. Hence, a decision was made to try and use the full front suspension travel and ground clearance. To achieve this, the front yokes have been designed with a forward offset and a step to guarantee enough clearance between the front tyre and the engine when in full bump. 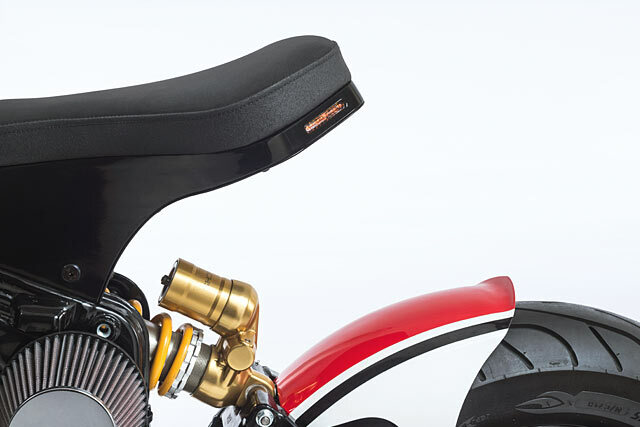 Similarly, the footpegs were designed to have the legs and back of the rider in the ‘correct’ position and the rear damper rod was increased in length to raise the body, increase the ground clearance and to give the bike a better maximum lean angle. 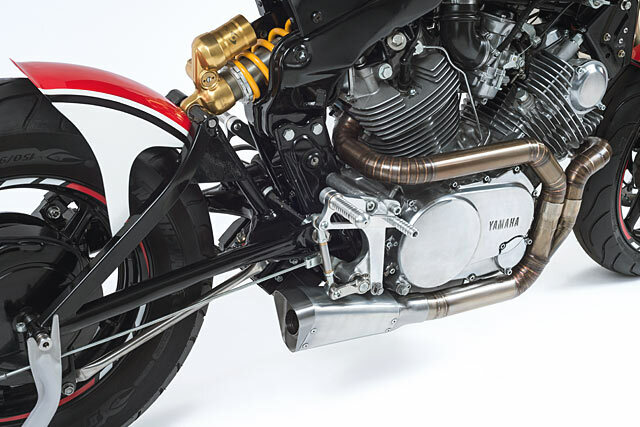 Also, the fork’s caster was reduced to more super sport values, improving the bike’s handling. 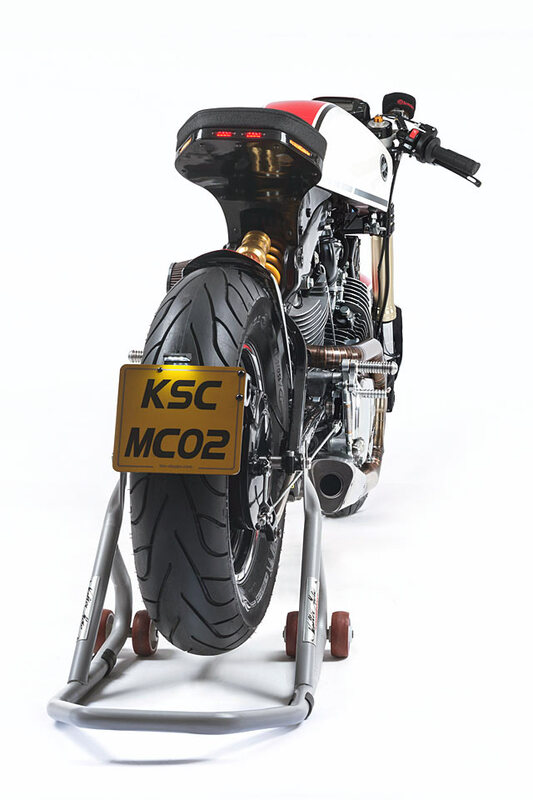 “The wiring loom was then reduced and placed under the seat with the main electrics; as you can probably tell, the seat was designed with this in mind and the tank was modified to look slimmer and sleeker”. Next, Massimo rolled his sleeves up and aqua blasted the cylinder block. All the rest was polished, the frame was painted and all the aluminium components were anodised. Then the reassembly began. 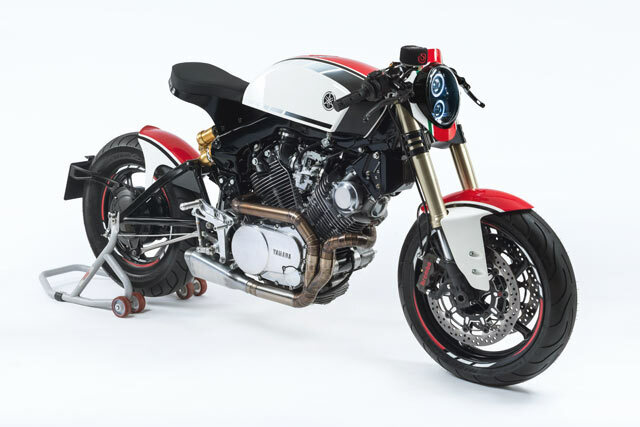 Finishing touches included some brakes courtesy of Brembo Racing, K&N filters, a fully digital dash, a bespoke headlight design, integrated rear lights and a classic Yamaha racing paint job from the 70s and 80s. 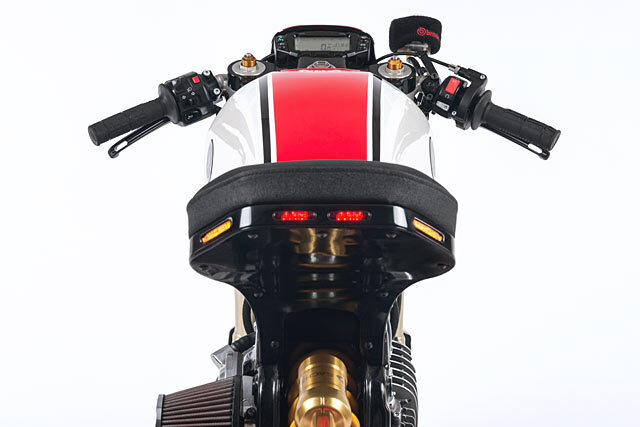 The team’s main challenges centred on the always tedious adaption of the bike’s old wiring to work with the required modern features, like the dash, speed pickups, brake lights and the handlebar commands. “The tank was modified a lot. 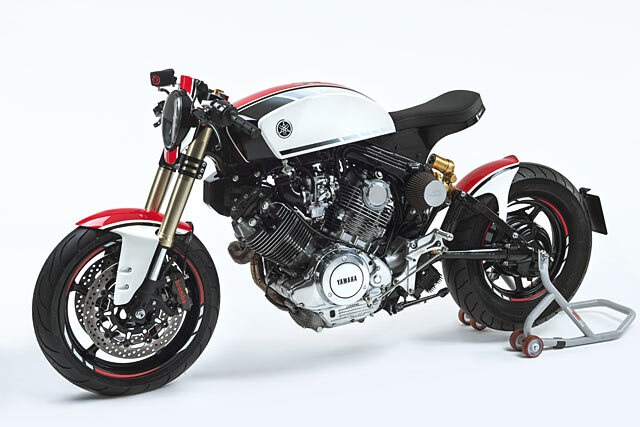 The original Yamaha unit was far too big, but it had some interesting features. Basically, we made it slimmer on the sides and the front was covered up”. “The exhaust really brings a smile to my face. They are one of our specialities”. “Looking at it now, I love the way the new tank and seat line with its ‘leaned forward’ look give the bike a great dynamic and it really supports the bike’s overall racing look. Also, the exhaust really brings a smile to my face. 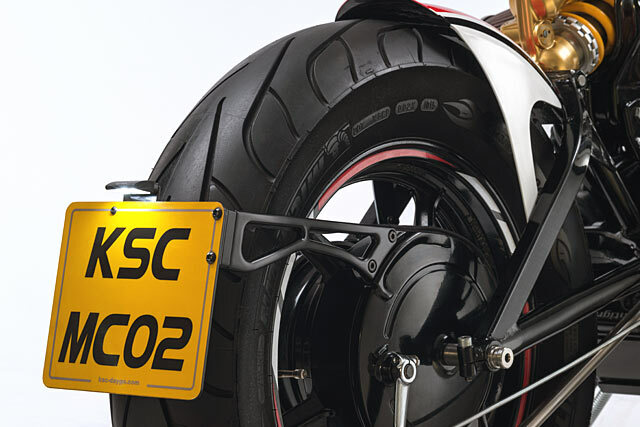 They are one of our specialities, and this one makes the bike very strong and solid-looking. Its design was inspired by circuit racing, and I think it really works well on the bike”. 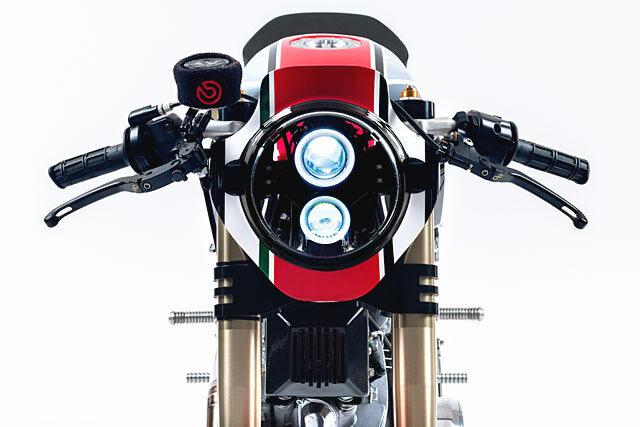 In a touching detail on the bike’s paint, the team managed to combine the Yamaha’s Irish and Italian influences into one neat touch. “On the headlight fairing a green line runs from the bottom to the top. As you’ll know, Green is the colour of Ireland and at the bottom it pairs up with the white and the red to show an Italian flag. Also, you’ll find a shamrock hidden in the paint if you search hard enough”. Looking for a lucky clover in the bike’s paintwork? Nice touch, huh?